The Atlanta area has many events from outdoor skating rinks to great light displays to celebrate the holiday, with most of the outdoor light displays open until the beginning of the New Year. There are many concerts, plays, special performances and events throughout the holiday season in Atlanta. Discover just a few of the many holiday attractions to experience this holiday season in the Atlanta area below. Holiday light displays are very popular destination points across the Atlanta metro area. With so many holiday light displays to visit, it is hard to choose which one to visit first! The Atlanta Speedway once again has the Holiday Light Spectacular this holiday season. The speedway is transformed into the biggest drive-through lighting display in the area. Visitors can travel through a winter wonderland with over 3 million lights now through December 30th. There will also be special events including face painting, meeting Santa and enjoy a winter carnival at Santa’s Village. Centennial Olympic Park in downtown Atlanta lights up for holiday season with Holiday in Lights running now through 1/3/2016. Viewing the lights is free and open to the public. There is also a skating rink that is open daily until 1/10/2016. The Atlanta Botanical Garden hosts Garden Lights, a holiday light extravaganza now through January 9th. Enjoy thousands of lights in this indoor and outdoor holiday display. Visitors can enjoy holiday model train displays, a ride-on-train around the garden and visits with Santa. The largest outdoor holiday display in the Atlanta area is at Callaway Gardens in Pine Mountain, Georgia. The outdoor resort changes into a magnificent Fantasy in Lights, a magnificent winter wonderland with over 8 million lights displayed in 15 different scenes. The holiday event has been voted one of the world’s top 10 places to see holiday lights! There is shopping, story time with Ms. Claus and train rides. The Christmas Village, a heated outdoor area, has a magical forest, a living nativity scene, food and many vendors perfect for holiday shopping. Fantasy in Lights run to January 2nd. Stone Mountain Park is hosting Stone Mountain Christmas. There are nightly Christmas parades with Rudolph the Red-Nosed Reindeer and Bumble, the Abominable Snow Monster. The holiday event has fireworks, walk-thru holiday light displays containing over 2 million lights, live entertainment, train rides, visits with Santa and Mrs. Claus, shopping and much more. The Georgia Aquarium has the Festival of the SEAsons running now to December 24th. The galleries are decorated in a winter holiday theme and you could also catch a glimpse of Scuba Claus! There is a holiday light and 3D projection show in the atrium every hour, holiday entertainment, family focused special events and much more. Christmas in Atlanta wouldn’t be the same without touching Macy’s Pink Pig in Lenox Square. The event is a 50 year unique Atlanta tradition that also has a children’s area, a train ride and more. Priscilla the Pink Pig train ride goes through a life-sized storybook featuring Priscilla and her friends. A portion of the proceeds from the event goes to the Children’s Health Care of Atlanta. For the thrill seekers, what is better than spending the holidays riding thrill rides? Six Flags Over Georgia transforms into Holiday in the Park with over one million LED lights, festive shows, train rides, culinary treats, visits with Santa Claus and much more now through January 3rd. The areas of the park are changed to twinkling holiday delights and entertainment showcases. A traditional holiday and winter activity is outdoor skating and there are many rinks that are open throughout the start of the new year in the Atlanta area. 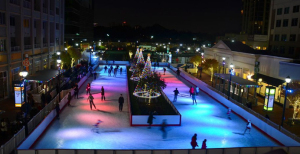 The Atlantic Station Winter Wonderland Ice Skating Rink is open to 2/14/2016. There is so many great holiday events to explore and do in the Atlanta area this holiday season! With the wonderful warmer weather there is no time like the present to get out and enjoy the great events! Merry Christmas and many blessings for the New Year from Storage World!